LANSING, MI — Despite hot, dry weather and drought conditions this summer, waterfowl hunters have plenty to look forward to this fall. 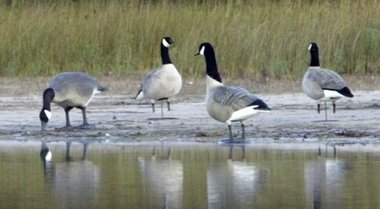 Michigan’s early goose hunting season opens Saturday statewide, and hunters will be allowed to take five geese per day. But beyond that, there is surprisingly good news. Avers is referring to the annual waterfowl survey by the U.S. Fish and Wildlife Service. It is done in what some call the “cradle” for North American waterfowl populations. It showed eight of 10 tracked nesting duck species in the prairies had dramatic population increases despite a significant decline in the number of ponds there. Some of those birds will migrate south through Michigan during the 60 day waterfowl seasons, boosting the number available to hunters, along with those that breed in Michigan. The FWS survey estimated 48.6 million breeding ducks in that region, a 7 percent increase over 2011 and a 43 percent increase over the long-term average from 1955 to 2011. It is a record high and only the sixth time the duck population exceeded 40 million. Among the highlights of the FWS report is a 15 percent increase in the mallard population from 2011, along with a 20 percent increase in green-winged teal. Canvasbacks were up 10 percent. Scaups were up 21 percent. Northern shovelers were up 8 percent, and blue-winged teal were up 3 percent. Both hit record highs. Dale Humburg, the chief scientist for Ducks Unlimited, the national wetland conservation group that monitors duck populations, said the early season dry conditions looked as though they would negatively impact duck nesting, but spring rains helped. Yet, that rain was not enough to keep the pond numbers from declining. The FWS survey estimated there are 5.5 million ponds in that region of the U.S. and Canada where most of the continental duck populations breed. That is 32 percent fewer ponds than last year. What all this means for Michigan hunters is that they can expect fewer ponds and less water in those inland areas of the state that they may favor. What ducks there are will congregate where there is water. On the other hand, it could be a good year for layout shooting on big, open waters. Diving ducks, such as scaup or “bluebills” as they are commonly known, were up 21 percent over last year, according to the FWS. They should be plentiful. That’s not all that was increased this year. The FWS also adopted a 92-day season for hunting Canada geese. That is more than double the 45-day season last year. There will be lots of opportunity to hunt geese this season. The reason for the change is a shift in thinking. Seasons were set, until now, based on the size of distinct populations and whether they were local giant Canada Geese or migrated in from Southern James Bay, the Hudson Bay or were part of the Mississippi Valley population. In essence: A goose is a goose is a goose. And there will be plenty of them available starting next Saturday. This entry was posted in Uncategorized and tagged Canada Geese, DNR, Ducks, Geese, Hunting, Hunting Seasons, Mallards, Waterfowl. Bookmark the permalink.